Often times we choose our rock shoes based on what type of climbing we will be doing. It may be aggressive shoes for face climbing, ankle protection for crack climbing, or really good shoes for smearing up walls. But, when you’re in the alpine comfort matters! I mean, who really wants to have to take their shoes on and off on a back-country multi-pitch route? Not me! 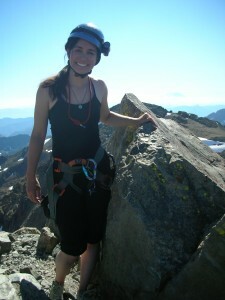 It’s easier all around if I can feel comfortable in my shoes AND have the versatility to climb many different styles. The answer? La Sportiva Mythos! (2) Sticky bottoms– Great for smearing to use the rock’s natural grip! (3) “Medium”-hard edges– Helps when using those tiny foot holds, but not so hard that the shoe loses its ability to smear well. (4) Light weight! — Adds minimal weight to the pack and making my feet feel light as a feather…like socks for rocks! Bottom line: These shoes are so comfortable that I can wear them for 8 hours on alpine rock climbs, or my full session at the rock gym. You can’t go wrong with all around versatility and comfort! There isn’t another like it for both quality and comfort. These shoes have lasted me over 2 seasons already! P.S. If you want a step up from the La Sportiva Mythos, try the La Sportiva TC Pro Rock. This shoe has a slightly harder edge for edging on climbs and features ankle protection for crack climbing. Extremely similar fit and function to the mythos, with just a slightly more specialized usage!